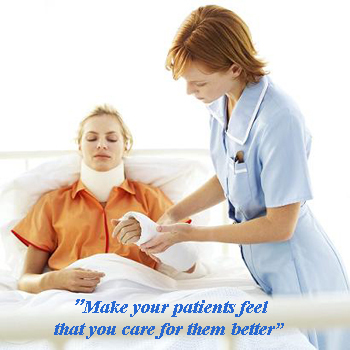 Patients' care is undoubtedly the main aim of all hospitals and Nursing Homes. Hence there is a need to provide one dedicated line of communication to every patient so that the patient can draw attention of a nurse from his bed whenever required. The resources that patients look for are good doctors, good medical equipments and timely care. Hence it is very much essential to have foolproof system by means of which patient can communicate with nurses/doctors to seek their help. In rapidly changing world, it is becoming essential for nurses only to take care of patients 24 hours without much help from kith & kin of patients. Nursing needs to focus on Quality care and extend utmost importance to the service of the patients and develop a sense of responsibility and accountability of total nursing with compassionate heart. Our Nurse Call System is designed keeping in view the relevance of quality nursing in today’s context and gives topmost priority to it. Installing our NCS in the hospital enables efficient management of nursing staff. WHY OUR NURSE CALL SYSTEM ? We are pioneers in Nurse Call Systems and recognized as leading manufacturers in India. Our Nurse Call system is accepted widely for its reliability and performance which encouraged us to develop several other products in the field of healthcare. 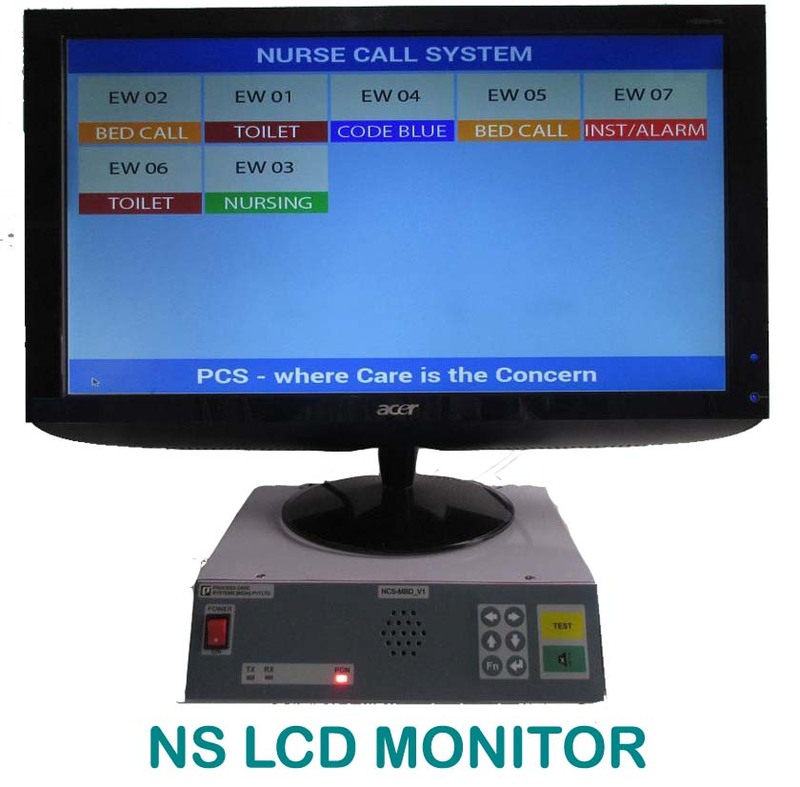 Our nurse call system replaced both imported and domestic nurse call system supplied by other manufactures. Our system are deployed repeatedly by several chain of hospitals. There also deployed at least 8 other countries. Designed by highly experienced engineers. Implemented in majority of hospitals across India. Room Number Display tailor made to customer requirements. Recognition from several multinational hospitals. Cost effective, efficient, compact and highly reliable. Availability of varieties of models developed to suit very small Nursing home of as small as 5 Beds to Multi Speciality Hospitals of Several thousands of Beds. Availability of separate model for replacing legacy buzzer system. 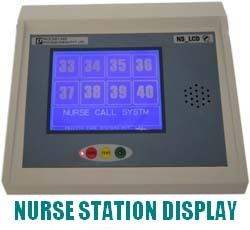 Varieties of nurse station display ranging from 1024 X 768 multicolor LCD panel to tiny 128 X 64 pixel LCD. Every model is equipped with suitable voice module instead of simple buzzer. Very low working voltage to ensure patient's safety. Carefully designed to make it easily installable and Maintenance free. Door indicator helps the nurses to locate the calling patient easily. Call from a patient remains registered till the nurse attends the patient and clears the call from his room. IP based interconnectivity of nurse stations. Multicolor room number display to distinguish different types of calls. High quality voice announcement for narrating type of call. Uploading of Room numbers through a pendrive. Various user selectable timing parameters and behavior adjustment. Provision for setting 4 different voice levels and assign to 4 different time slots. Listing of calls in the order of time of origination. Includes all the features listed under Enterprise model. Designed to cater to hospitals with more of shared rooms with facility to interconnect all the nurse stations. Allows for segregating Nurse Calls and service calls to be routed to separate displays at different locations. Very Comprehensive system with many enhanced features including CODE BLUE. The networked nurse call system can generate management information reports and alerts for unattended calls. It is ideal for hospitals having only one nurse station and more than eight beds. Very simple wiring and easy to install. This model can easily be fitted in the currently running hospital using buzzers for Nurse call. 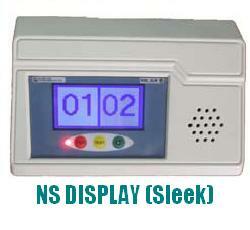 Functioning is same as that of NCS Esteem except that it makes use of Sleek Nurse station display. It is recommended for hospitals/ Nursing Homes having to cater to less than 8 beds from a nurse station. The dynamic windows on the LCD display helps reducing the wall space. One row of scrolling footer text to describe calls. Highly economical, can work with simple locally available push buttons & switches. Designed to carry out dual functionality for doctors operating from OPDs Viz: to seek assistance from Nurse Station and to indicate the presence of the doctor in that OPD. Only one Cat5 cable is made use of to convey both information to Central Station. Common door indicator used to show the presence of the doctor as well as a pending Call. While for the doctors' presence indications, Static LED based windows are used. For indicating Origination of call, an LCD display windows is made use of. The System can also provide for triggering call from the Toilets in the OPD Area. Various other models available: Contact to know about more models to cater to varieties of requirements.